Hypertension or high blood pressure contributes to more than 1,000 deaths per year. Over 50 million Americans are dealing with this condition. No knowledge about the causes of high pressure is one of the biggest reasons why more and more people are becoming a victim of this potentially life-threatening condition. It is true that the exact cause of hypertension isn't clear, but several factors and other conditions can contribute to the development of this condition. Some of the most common factors are obesity, smoking, excessive salt intake, lack of physical activities and stress. Many people understand how obesity or smoking can play a role in the development of high blood pressure, but they really want to know the relationship between high blood pressure and stress. Can stress cause high blood pressure? Keep reading to find the answer. When you are in a stressful situation, your body releases stress hormones that temporarily raises your blood pressure. This will increase your heart rate and narrow your blood vessels as well. The most important stress hormones are cortisol, aldosterone, catecholamine, endorphins and vasopressin. Since it's a temporary change, your blood pressure should come down to normal once the stress trigger is no longer present. So, can stress cause high blood pressure in the long term? There is no evidence that stress has a direct link to hypertension. However, certain behaviors that are associated with stress can cause high blood pressure. You may start overeating when you're in a stressful situation. Some people start drinking alcohol or develop poor sleeping habits due to stress. All these behavioral changes can lead to high blood pressure. Moreover, you may end up developing long-term high blood pressure due to consistent stress-related spikes in your blood pressure. Some stress related conditions can also cause heart disease. For instance, depression, anxiety and isolation can play a role in the development of heart disease. It happens because the hormones produced during stress may damage your arteries, which in turn will lead to heart disease. 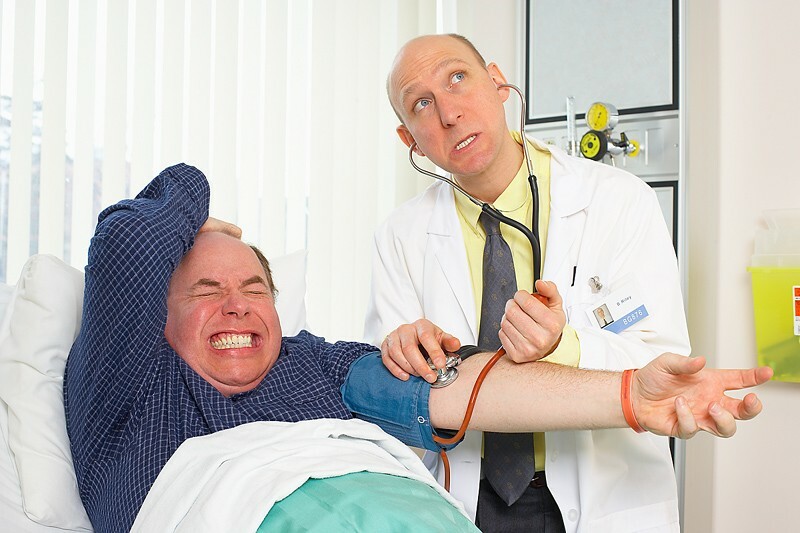 Now that you know the answer to your question, "Can stress cause high blood pressure?" you may want to know how to deal with the whole situation. First thing you need to understand is that even though stress can raise your blood pressure for a short time, the spike can be quite dramatic. It is, therefore, important to make certain lifestyle changes to protect yourself from high blood pressure and other cardiovascular diseases. In fact, most people don't really know they are in stress, which can be bad to their health. Below are several mental, physical, behavioral and emotional signs that will help confirm if you're under stress. General aches, dizziness, grinding teeth, indigestion, clenched jaws, muscle tension, racing heart, difficulty sleeping, sweaty palms, stooped posture, trembling, tiredness, unexplained weight loss or weight gain, upset stomach, etc. Clouded judgment, constant worry, inability to concentrate, forgetfulness, loss of sense of humor, lack of creativity, etc. Crying, anger, feeling powerless, depression, loneliness, irritability, mood swings, nervousness, negative thinking, sadness, etc. Compulsive eating, bossiness, explosive actions, critical of others, increased use of drugs/alcohol, impulsive actions, withdrawal from social situations, etc. When you notice certain signs of stress, you should take some steps to bring things back to normal. Instead of asking, "Can stress cause high blood pressure?" you should pay more attention to making certain changes to your life to reduce stress. Enjoy Music. Take a break and listen to some relaxing music to get out of a stressful situation. Listening to calm music may help reduce cortisol levels in your body that in turn reduces blood pressure and makes you feel better. Listening to nature or ocean sounds may also have calming effect on your nerves. Talk to a Friend. The more you go into isolation, the harder it becomes to get out of stress. Call a friend and talk about your issues. A reassuring voice of a good friend will help change your outlook to life and make it easier to get out of your stress. Talk Yourself Through It. When you cannot share it with a friend, share it without yourself. Talk calmly to yourself, telling yourself the reasons why you're stressed out and reassuring that things will be fine. Have a Balanced Diet. A proper diet and stress levels are closely related. You're going to make your stress even worse by resorting to fatty, sugary snack foods. Avoid the vending machine and add more vegetables and fruits to your diet. Fish with omega-3 fatty acids have proved extremely beneficial against stress. Try a tuna sandwich to have the power to get out of a stressful situation. Laugh It Off. Spend time with friends who make you laugh or watch something that gives you a good laugh. Laughing your heart out will release endorphins that change your mood and decrease the levels of stress-causing hormones in your body. Avoid Caffeine. A large dose of caffeine can lead to an increase in blood pressure, so you should replace energy drinks and coffee with green tea, which has less caffeine with loads of healthy antioxidants. Try Meditation. Be mindful and make use of some meditative exercises, such as yoga. Other physical and mental exercises such as meditation, tai chi and even Pilates will help prevent stress and keep your heart healthy. Sleep Better. When you're under stress, you will lose sleep. In some cases, you end up being stressed due to lack of sleep. You should get 7-8 hours of sleep daily to prevent stress. Use Drugs. If you have high blood pressure, you need to take steps to avoid getting in stress and take your medication regularly as prescribed by your doctor. These medications aren't helpful in controlling stress, but they work effectively to keep your blood pressure in check. Take Deep Breaths. Learn to take a deep breath when you find yourself in stress. Maintaining a right breathing technique will go a long way in preventing and managing stress that in turn will help keep your heart healthy. It also clears your mind, centers your body, and supplies oxygenated blood to all the cells in your body. Below is a very interesting and helpful video to tell you more ways to manage the stress. Always keep in mind that though stress has become an integral part of today's world, you can take steps to make things more manageable. The use of some strategies and being patience will help reduce stress and improve your overall health.